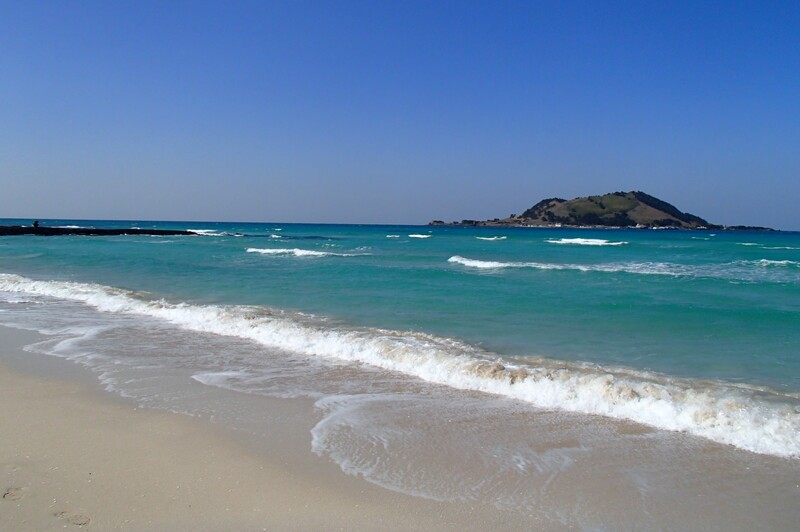 Part of Hanrim Park, Hyeopjae Beach stretches all of 9 km (5.6 mi), its white sand colored by crushed seashells. With an island just off the coast and mountain in the background, the beach offers plenty of scenic views. Some 20 m (66 ft) wide and about 1.2 m (4 ft) deep, its shallows are smooth without abrupt drops. Evergreen groves behind the beach provide a convenient spot for camping, with a number of amenities such as showers and eateries. Hyeopjae Beach is just one of the many highlights you can arrange to see using our world travel planner, Jeju Edition. Hyeopjae Beach is my Choi seaside ㅎ ㅎ is always heard when visiting Jeju ㅎ ㅎ a sunny day in a café if you look at the beating waves and the non-transferability to see away, then the healing is ㅎ ㅎ and the setting sun at the isthmus is really the best! Maybe best beach on Jeju... beautiful, clear water with offshore island. Camping available. Lots of little restaurants around. Worth a visit.